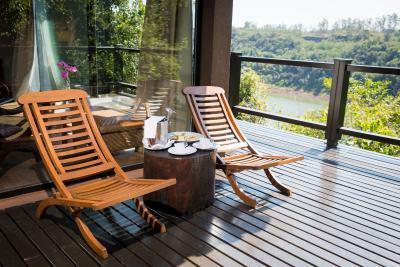 Lock in a great price for Loi Suites Iguazu Hotel – rated 8.9 by recent guests! 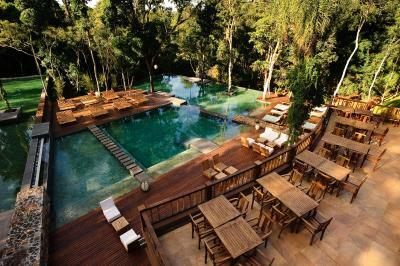 This is a beautifully designed hotel, built into a hillside in the jungle, with a small river running through it and adding to the ambiance. 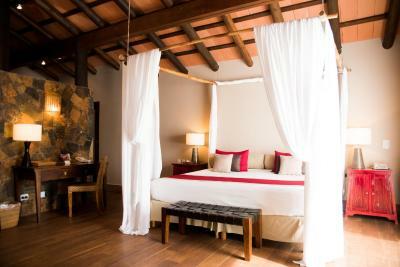 The staff were lovely, the room was large and very comfortable, and the restaurants and facilities were very good.. I love this property. It is in the middle of the forest. Very, very nice. Our rooms were very spacious and clean. Everything we needed worked perfectly- comfortable beds, nice air conditioning, hot water, great WiFi. 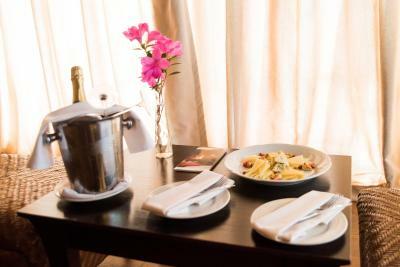 The staff was very courteous and always smiling. The breakfast was above and beyond, with many delicious choices. Both restaurants were great. 701 for dinner was excellent and the Tiki Bar for lunch or drinks was good too. 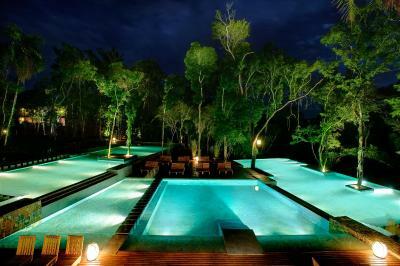 The pool area has four different pools on different levels with trees within and around. The chaises loungers are padded and very comfortable. Just an amazing place. We would come again in a minute! Everything was just perfect! The villa had all you will ever need and the view from balcony and the outisde jacuzzi was pretty good. Staff is great and was present when necessary. Hotel facilities were also great. Food at the bar is practical but not outstanding. It might be better at the restaurant but I haven't had the time to try it out. 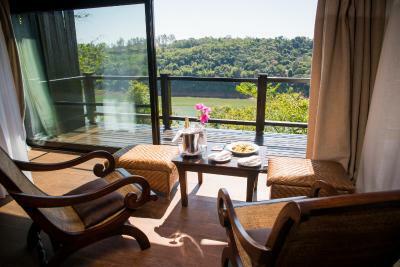 Furthermore, the location of this hotel is amazing, it is in the nature and you even have a walking path inside the "forest" within the resort, so if you want to relax and enjoy some fresh air, this is the place to be! 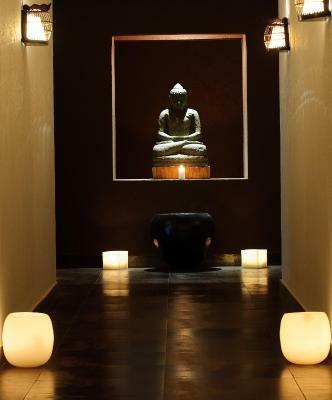 From the moment you arrive you experience 5 star treatment. Beautiful grounds, pool area and rooms. The food is fantastic wether poolside or in the dining room. The staff are totally happy to help with any travel issues or tours. Great experience and we’d love to return. 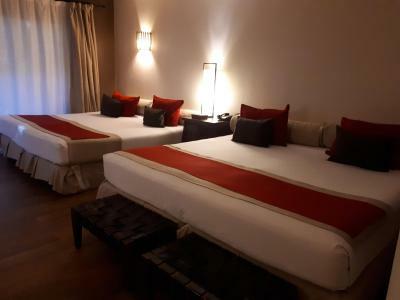 location, comfortable rooms and great facilities. staff in general terms very friendly (except for customer service). 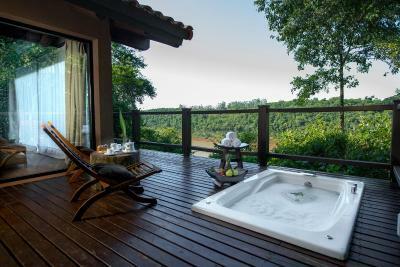 Great place to relax and be close to nature. About 10 min drive to city center of Puerto Iguazu and about 25 min drive to Argentina side of Iguazu Falls. Pool is really nice and the service in the Spa was good. 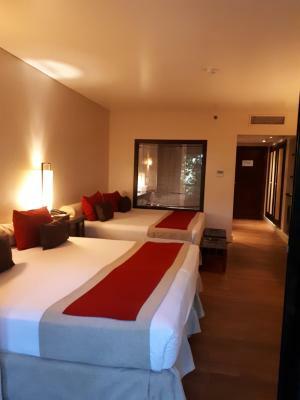 The staff is friendly - we felt very welcomed, the room was very clean and beautiful, breakfasts are very tasty, pools are kept clean, masseurs are the best in the world! I absolutely loved how the hotel is surrounded by nature, harmonizing with its architecture. We even saw toucans and a monkey from our balcony! 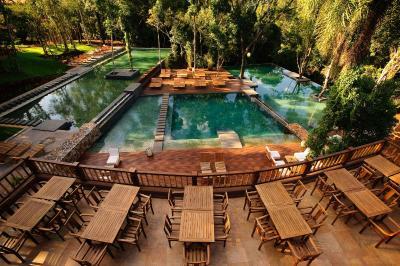 The pool area is just beautiful (including an adjacent bar allowing for romantic evening drinks) and there is a forest trail to explore the property. Although the complex is quite large, it does not feel like it at all and allows for much privacy. The staff was very friendly and helpful. I would definitely go back again! 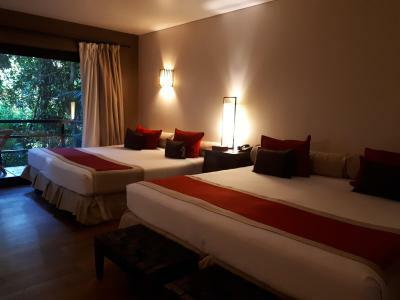 Loi Suites Iguazu Hotel This rating is a reflection of how the property compares to the industry standard when it comes to price, facilities and services available. It's based on a self-evaluation by the property. Use this rating to help choose your stay! 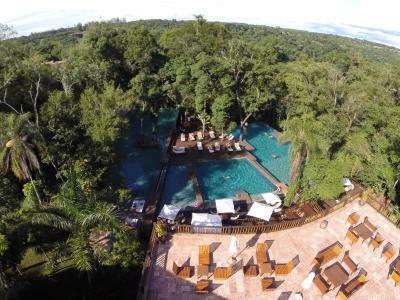 One of our top picks in Puerto Iguazú.In the subtropical forest, just a 15-minute drive from Iguazu Falls, this luxury hotel features a spa, an outdoor pool and suspended bridges. WiFi is free throughout the hotel. 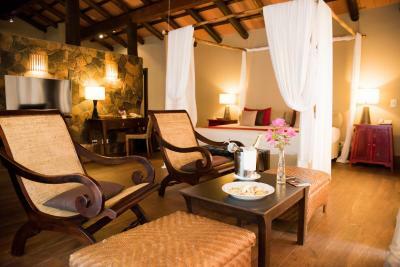 Loi Suites Iguazu Hotel has 5-star facilities and décor. There is a sauna room and an outdoor pool with a deck area. 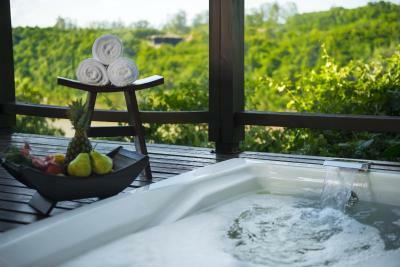 It features top of the line architectural style, fully integrated with the impressive natural setting. 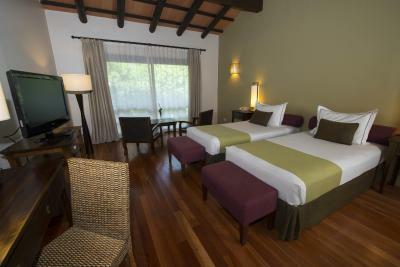 The air-conditioned Loi Suites have parquet floors, pale olive hues and rich fabrics. 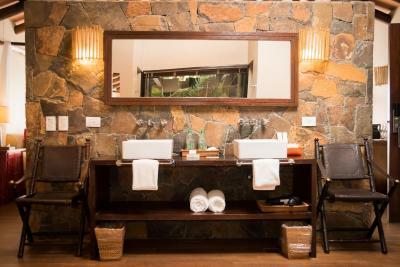 They include cable TV and bathrooms with baths. 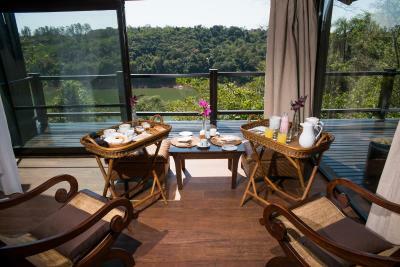 Some rooms feature ample balconies with undisturbed jungle views. 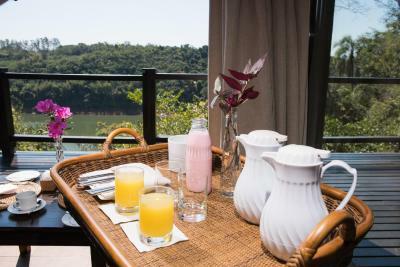 Naipi Restaurant offers local gourmet cuisine and views of the subtropical forest. Tiki Bar has light lunches with regional flavors. 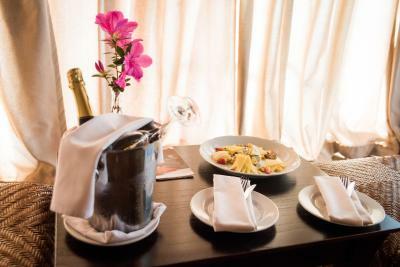 There is room service. 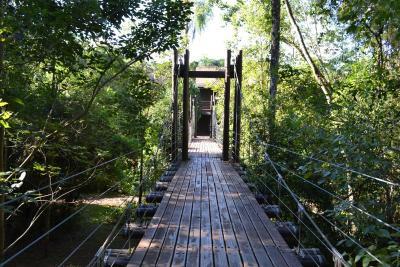 The tour desk is ready to arrange trekking and horse riding trips in Iriapú jungle. Car rental services are also possible. Private parking is free. 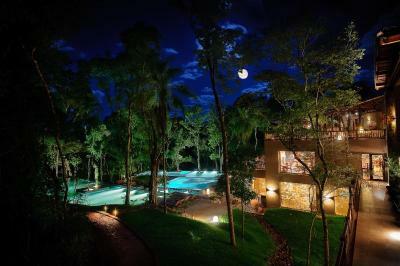 When would you like to stay at Loi Suites Iguazu Hotel? Features air conditioning, heating, cable TV and private bathroom. An additional bed is available upon request. Offers forest views. 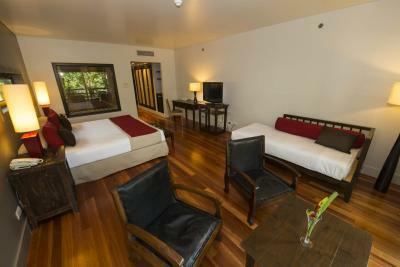 This studio features a French balcony overlooking the subtropical forest. Additional beds cannot be accommodated in this room. Offers forest views and access to gym and pool. 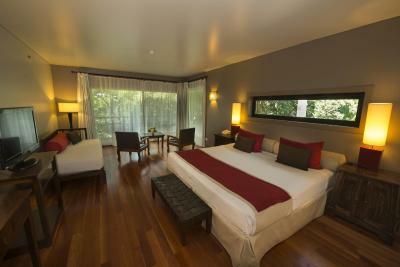 A spacious suite with a balcony overlooking the subtropical forest. Additional beds cannot be accommodated in this room. 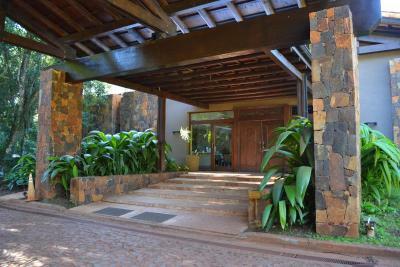 Offers forest views and access to gym and pool. 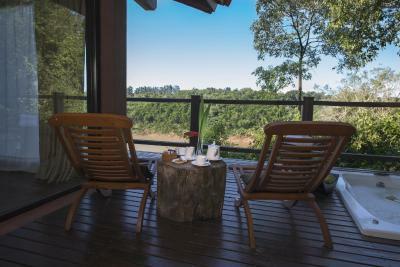 The room features a spacious balcony overlooking the subtropical forest. An additional bed can be accommodated upon request. 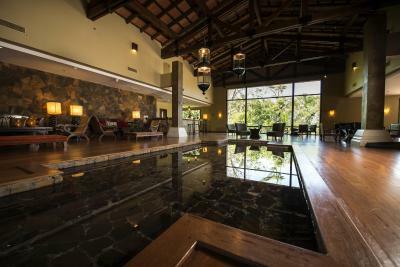 Offers forest views and access to gym and pool. 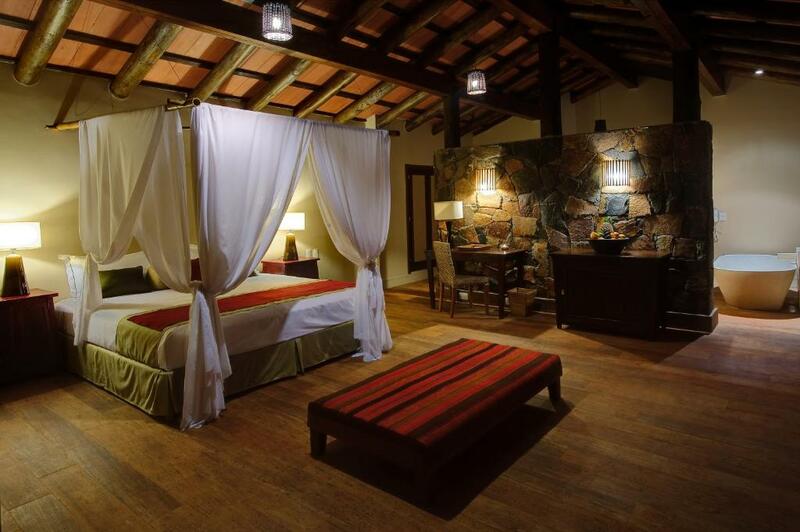 Features a spacious balcony, mini-bar, heating, flat-screen TV and air conditioning. 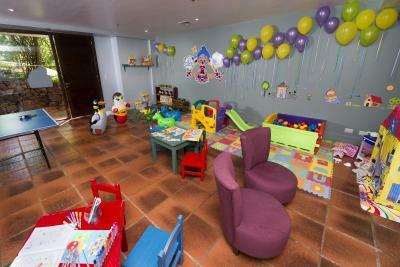 No children or extra beds can be accommodated in this room. 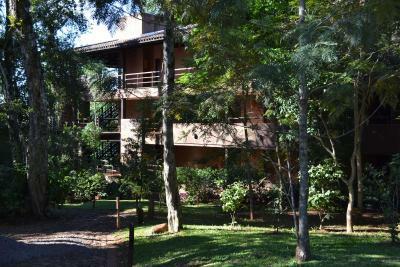 Offers forest views and access to gym and pool. Features air conditioning and cable TV. Additional beds cannot be added in this room. 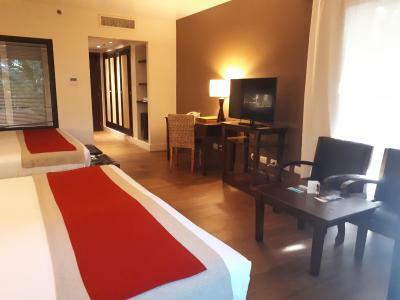 This room features a King Bed, 57m2 + 30m2, a balcony with hydromassage, Wifi, Frigobar, Air Conditioning, Security Box, LCD with cable TV service, Coffee machine with courtesy coffee capsules, Electric kettle. -Late check out without charge. 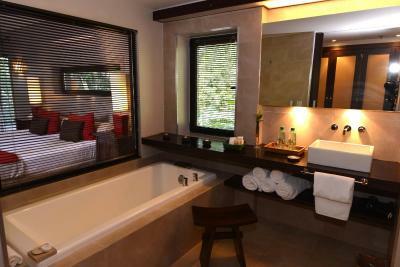 This quadruple room has a balcony, mini-bar and bathrobe. 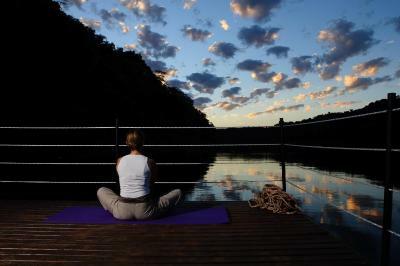 It offers forest views and access to the gym and pool. 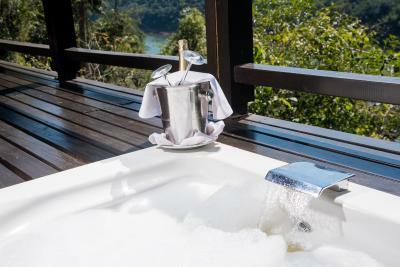 House Rules Loi Suites Iguazu Hotel takes special requests – add in the next step! 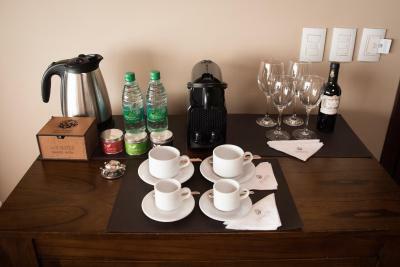 Loi Suites Iguazu Hotel accepts these cards and reserves the right to temporarily hold an amount prior to arrival. 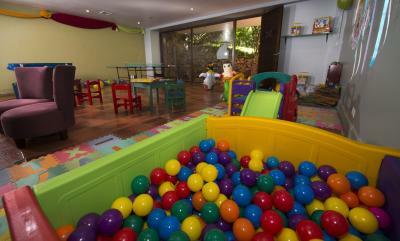 No children can be accommodated in Villa units. 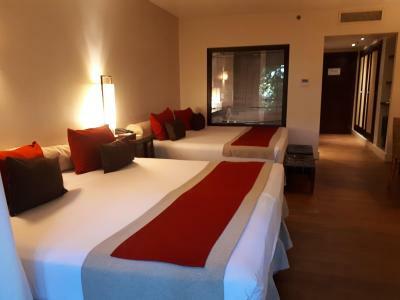 Please note that extra beds are limited to availability and only available in some room types. 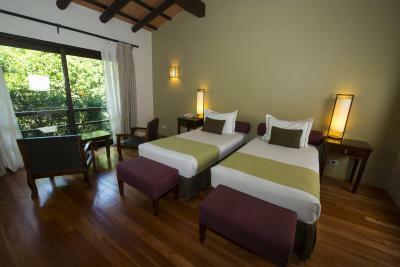 Eco-tourism rate of Puerto Iguazú will be charged at the hotel at the time of Check-In. The cost is USD 1.30 per person per night, with a maximum of 2 overnight stays. 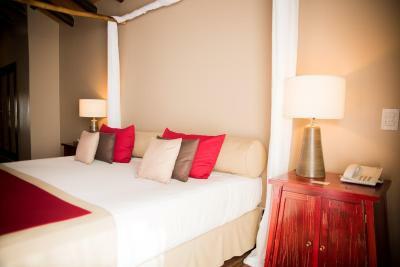 In longer stays, the subsequent nights are exempt. 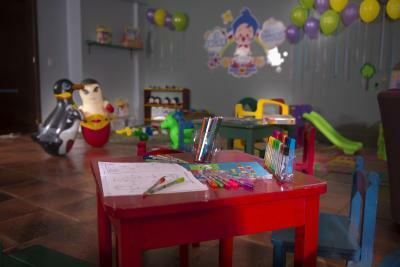 Children under 12 years old and pensioners are exempt from payment. Payments must be in cash, in local currency. Note that on the 24th of December and 31st of December guests will enjoy a gala dinner at the property upon reservation. Rooms could use updating and are rather basic, my biggest grievance was that there was no concierge to help plan and arrange excursions—front desk staff expected to do it all and yet were often quite busy with checking people in and out—hotel probably perfect for the big tour groups which stay here and don’t need guidance but adding a concierge desk with information on bird parks in Arg and Brazil, options within and outside of both national parks, and suggestions for shopping and dining in town, would have been great for this solo traveler. Great service, made visiting the waterfalls simple and easy. Great views from the rooms and setting. The nice guy at the reception Nahuel upgraded our room, thanks to him! The only thing that they can improve on is the service at the Tiki Bar. It takes an unusually long time to get acknowledged, get a drink and get food. Once you get their attention it is better but still takes long. This was the case for many customers, not just us. The restaurants serve mediocre food at best. Prices are not cheap (not expensive either for a hotel in the middle of nowhere) but quality isn’t great and service isn’t great either. Nice location, within a natural reserve. Great pools in a very quiet environment. Staff is very slow taking out orders for food and drinks. 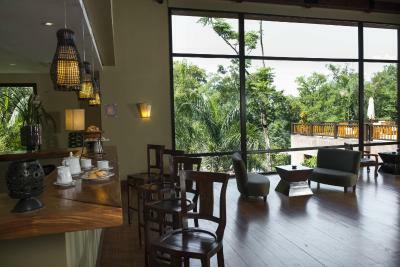 At the reception, the hotel could offer welcome drinks and be more warming with guests. 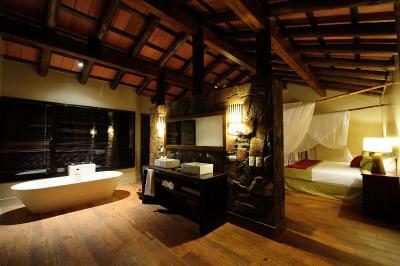 The surroundings are amazing, rooms are very well located and with excellent privacy. The pool is something else, one of the best pools ever in my life. Nothing. Maybe that we had to leave. Probably the best location if you want to relax and have a time in paradise. Great staff that help with any kind of problem. 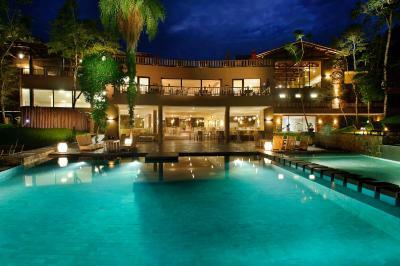 Love the pool area and we prolong are stay 3 time.